Pike Place® Roast is a tip of the hat to our history in Seattle’s Pike Place Market and a heartfelt toast to everyone who loves rich coffee. It’s also one of our most popular blends. Specially roasted to be a very smooth, easily enjoyed, all-around-great cup of coffee, Pike Place® Roast offers a rich, balanced flavor with subtle notes of cocoa and toasted nuts. It’s the perfect coffee to enjoy as your everyday brew, whatever your day entails. You may also be happy to know that Pike Place® Roast is a Starbucks™ Shared Planet™ coffee, made from 100% responsibly grown and ethically traded coffee beans. 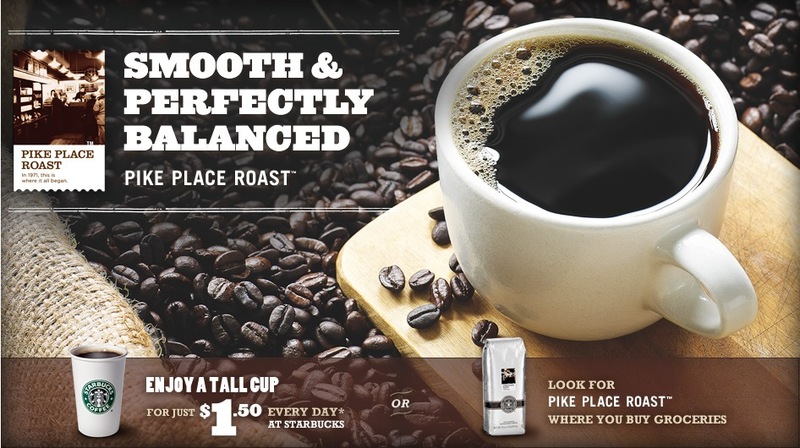 Smooth Pike Place® Roast – enjoy a Tall cup for just $1.50 every day* at Starbucks. Or look for it where you buy groceries. A tip of the hat to where we come from and what we stand for. The bold flavor and smooth finish you love, but you know, decaffeinated.